Beyond the products themselves, Cornerstone goes beyond the job of supplying you with the products. We’re committed to servicing our customers to complete satisfaction. Whether a preventative maintenance program is required, or a customer is in a breakdown situation, Cornerstone is committed to quick service in a professional manner. Our customers are important to us, knowing their business is our business. 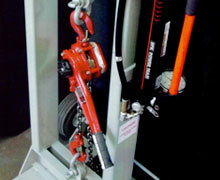 We offer scheduled inspections, when the customer requires them. Whether you want to stick by the mandated annual inspections or your place of business desires more, we’ll make sure to keep your inspections flowing smoothly, on time. Our certified technicians come highly trained, and are continuously expanding their knowledge of the products available on the market, to ensure the best inspection process. We’ll ensure that your records are kept up-to-date, so you can remain at peace when your inspections are complete. Please contact us today, and we’ll work with you to structure the right program for your needs. Cornerstone offers installations to our customers, new and old. Whether needing help with equipment bought through Cornerstone, or moving old equipment and re-installing in a new location, we’re here to help you make that process as seamless and stress-free as possible. Our service team includes a very dedicated group of installers, who go that extra mile to get the job done right. Please contact our service team today, and we’ll make sure to go through each step to ensure the best possible experience when installing your equipment. Nothing lasts forever, but our team is dedicated to keeping your equipment in tip top shape for as long as we can. 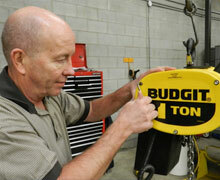 Our technicians are completely certified and always learning more to best service your equipment at a competitive price. Our large completely-stocked warehouse of OEM parts will ensure that your equipment is repaired in an expeditious manner. No headaches required when you trust Cornerstone for your service needs. Please contact our Service Team today, and we’ll work with you to get your equipment working again. 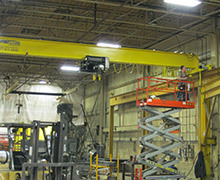 We understand that keeping your equipment operating at all times, and keeping its life long-lasting is important to you. Through our inspections programs, we plan to keep things running as smooth as possible, but that’s not always the case. We’re available 24 hours a day, 7 days a week for breakdown situations, and remain committed to keeping your business running. Please contact our Service Team for more information, or continue browsing the listed offerings available. Sometimes an oldie is a goodie, as they say. Cornerstone offers services in rebuilding old and rundown units. Whether it’s been beat down from a special application or just years of work, we work to bring it back to life both in function and aesthetics. 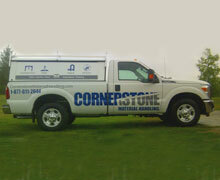 Youre equipment is in the right hands with Cornerstone. Please contact our Service Team for more information on returning your used equipment back to it’s former glory. 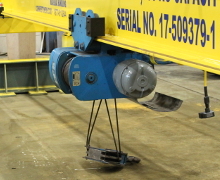 Load Testing of overhead material handling equipment is a requirement for many safety regulations. By actively overloading the equipment, we can ensure that your equipment is capable of handling the rated load in safe manner for all involved. At Cornerstone we pride ourselves in the best service people in the industry, with the best knowledge of how to do each job, including load testing your lifting needs. This service can be performed either in-house or at your location, depending on the size and type of equipment, or convenience for you as the customer. 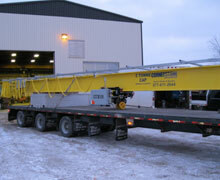 We provide our customers with Load Test Certificates for their records following each load test we perform. Please contact us today for more information on what we can do for you.